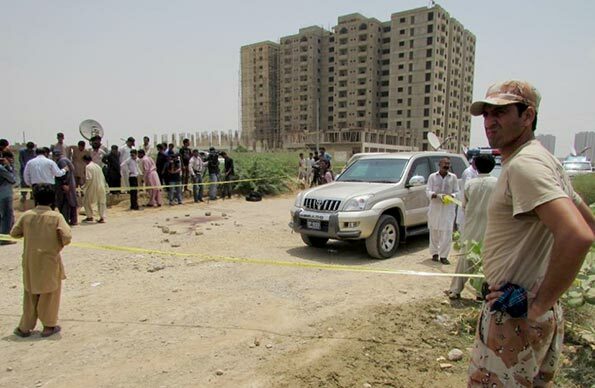 KARACHI, Pakistan — Gunmen killed more than 40 people on Wednesday aboard a bus in southern Pakistan bound for a Shiite community center, in the latest attack targeting the religious minority. A splinter faction of the Pakistani Taliban called Jundullah, or Army of God, claimed responsibility for the attack. A man purporting to be a spokesman for the group called The Associated Press from an undisclosed location and said “infidels were the target.” The purported spokesman, Ahmad Marwat, has conveyed similar claims in the past. Wednesday’s attack was the deadliest in Pakistan since December, when Taliban militants killed 150 people, mostly young students, at an army-run school in Peshawar. Pakistani army chief Gen. Raheel Sharif cancelled a three-day visit to Sri Lanka after Wednesday’s attack. He and Prime Minister Nawaz Sharif visited Kabul on Tuesday, where they pledged to work with the Afghan government to fight militants. “Terrorists have chosen a very peaceful and patriotic community to target in order to achieve their nefarious designs,” he said.